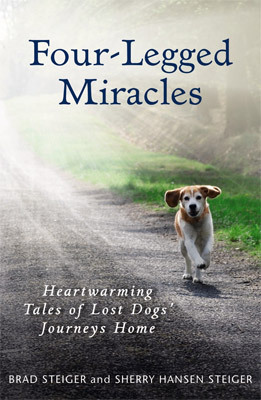 Four-Legged Miracles is a collection of wondrous lost-and-found canine sagas - actual Lassie, Come Home tales - that highlight dogs' remarkable abilities to return home despite almost unbelievable odds. Brad and Sherry Steiger have collected dramatic, carefully documented true-life anecdotes that showcase canines' amazing intelligence, courage, and sometimes seemingly supernatural powers. Often, there are no sensible explanations for how the dogs have come home, overcoming obstacles like natural disasters and fierce wilderness areas, predators, crippling disease and grievous injuries, emotional distress, and more to find their families. These fascinating reunion stories include: Mason, the white terrier who crawled home on two broken legs to what remained of his family's tornado-ravaged house; Buca, who sat on a hill over Utah's Rte. I-15 for two months waiting for the car he knew would bring him home; and Eddie, the beagle, who walked 450 miles over four months to reunite with disabled four-year-old Jimmy, inspiring the boy to work harder on his own recovery. Four-Legged Miracles will tug on readers' heartstrings, but it will also discuss common reasons dogs disappear, how to get a missing dog back faster, the dog-human bond, and the science behind some of the amazing journeys these dogs endure. Chock-full of happy endings, Four-Legged Miracles lends insight into dogs' hearts and minds and is a treat for any animal lover. Brad Steiger and Sherry Hansen Steiger have - together and separately - written more than one hundred books including Christmas Miracles (winner of the 2002 Storytelling Award from Storytelling World magazine) and Dog Miracles. The Steigers have appeared on Hard Copy, Inside Edition and Entertainment Tonight, and in specials on HBO, Discovery, History, and A&E. They were featured in twenty-two episodes of the syndicated series, Could It Be a Miracle?